The Doppelrock | Great Lakes Brewing Co.
A: Dark ruby, mahogany color..hard to tell, but there appears to be lots of floaties in there. Finger or two of off-white almost tan head. Not a lot of lacing, but nice film with bigger bubbles around edge of glass. S: Wow. I don't have a lot of experience w/ Doppelbocks, but this caught me off guard. Very full and rich. Roasted malts, dark fruit, mild chocolate. Man..that's nice. T: Pretty complex. Roasted malts, tart fruit and a sweetness from the chocolate malts. The alcohol is slightly present in the finish, but unless it's heavy, I won't complain. M: Full, rich and smooth with just a little bit of tingle from the alcohol. O: Again, I don't have a lot of experience with the style so I may be overrating this a bit, but I like this a lot. This is a very interesting, complex and enjoyable beer. I'll get it again. Review taken from notes Spring 2012. I've been wanting to put this into my BA log for a while now. Finally getting around to it. 12 oz brown bottle with 2 guitarists shredding some sort of rock riff on a live stage. I've played guitar for probably 15 years and this label appeals to me. Poured into a standard 12 oz tall like mug. A - deep amber reddish brown. Chestnut looking color. Head isn't large at all but did last longer than I expected and formed a tight ring of lace leaving a touch of stick here and there. S - malt.. Malt.. And more malts. Sweet aromas of cinnamon bread and dark fruits. A real breadiness to it. Sweet malts galore. Delicious aroma. T - a really good malt flavored brew here. Lots of sweet malt, bread, hints of cinnamon spice, an abundance of more dark malts paired with some dark fruit. Plum, raison, sweet prunes, and a dark cherry. Sweet liquid bread with a lot going on. M - rich mouthfeel but surprisingly thicker than what I expected going in. GLBC always have good texture but I was worried that their thinner liquid style may not line up for a doopelrock and while its not as thick as some it still has excellent coating and texture. Very drinkable without being too rich. O - the closest American made doppelbock to the original German versions I've ever had. I didn't see this brew in 2013, and I hope it's not completely gone. Very underrated and under appreciated doppelbock. GLBC make a lot of great ales, but I don't think any American brewery does lagers like they do. Lagers are forgotten in today's beer universe, but I'm telling you right now, this as is all GLBC lagers some of the best on the planet. If this is released again grab it and try it. It's a top notch doppelbock. A lost review! Found some notes in my notebook from June 9, 2011. Woop woop! Poured into a nonic pint glass at TJs Great Lakes Family Reunion. The color is deep brown, much lighter around the edges, with amber-y hues throughout when held up to the light. 1 cm head with moderate retention, though it produces some friggin incredible delicate and cobwebbed lacing. Just gorgeous. The bouquet is full of caramel and chocolate; rich, but somewhat one-dimensional. The flavor adds some roasty coffee-like notes and a European earthy hop character to the caramel and chocolate, bringing out a more well-rounded feeling that I got from the nose. The body is creamy and full. The only thing that falls short here is the aroma. 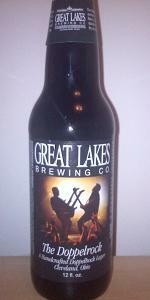 Another very good German-styled offering from the folks at GLBC. Pours a deep amber to brown-ish color with a light tan head. In the aroma, small roastiness and mellow lager notes. In the taste, roasted malts and a lager like feel all the way through. A smooth and medium to lighter bodied mouthfeel, with a semi dry caramel like aftertaste. EH! Its OK, thin and lacking flavor for what it is. Best before 5/29/2012 - so just missed that. Poured from a 12oz bottle into my Harriet pils glass. Dark auburn liquid with a fine creamy beige collar and slick. Pasty even lacing, fine fast running legs. Very rich bready aromatics suffused with melanoidins. Hints of tobacco, cocoa, coffee, bread crusts, and dark brown sugar. Low fruity esters on the palate along with dark fruit and dense malt. The melanoidins come through again with rich toasted bready flavors. Alcohol is a bit strong in the finish. Dense full flavor is quite satisfying, though not as complex as the best examples of the style. Excellent none-the-less. poured copper color into the glass with about one inch of head. nice rich roasted malt aroma hinting of chocalate. nice full flavor with a drier hop finish. this beer is nice full bodied. left nice lacing down the glass. i am happy to have three left for enjoyment. suckem up and movem out! Clearly, none of the previous reviews of this brew written here have been done so by anyone with the ability to properly compare this dopplebock to that of its ancestors. Being stationed in Germany from 1984-1987, I have had first hand (mug) experience with the true German Dopplebock. Great Lakes has hit this one out of the Jake, across Lake Erie, and right down I-71 (which is backwards I know...so sue me). EXCELLENT JOB GLBC! YOU ROCK THE DOPPLEROCK! Pours 1/2 finger of beige head. Fades to a thick ring. Color is a dark caramel copper brown. Aroma: Big biscuit flavor. Very malty. Caramel and toffee. Seems to have some scotish malt flavors to it. Kind of roasty. Taste: Again, all malts. Toffee, caramel, biscuit, and some scotish malt flavors. Boozy. Dark dried fruits. Molasses. Mouthfeel: Dry and roasted. Medium bodied with a medium amount of carbonation. Ends dry and boozy. Overall, too much malts for me. Straight up all malts. Too boozy as well. Just not a good dopplebock imo. A. Dark amber to ruby red with a one finger tan head that breaks quickly and settles to a full covering skim. S. Some brown sugar, malty bread and a hint of graphite. T. Toasty sweet malt that leaves caramel and brown sugar notes on the palate. Finishes crisp with a bit of hoppiness. M. Light to medium bodied with moderate carbonation. D. Easy drinking and overall pretty enjoyable for a doppelbock. I was expecting a bit more body and some more complexity. Glad I bought a 4-pack but I am not dying to grab more. A- nice clear dark brown with orange highlights. tan colored foam is dense and frothy and settles quickly leaving minimal lace, but holds at about 1/8in disk. S- sweet and toasty aroma of brown sugar, caramel, molasses, chocolate, mocha, marshmallow, and floral hops. sandalwood and plumeria add a fragrant spice. T- toasted and sweet with a hint of alcohol. burnt cookies, caramel, nutty, chocolate, coffee, hazelnut, pecan, damp wood, soil, nice herbal bitterness throughout. finishes pretty clean with long lingering malt flavors. there's some astringency however, and i don't like that in this style of beer. MF- robust and a bit syrupy with low carbonation, this is almost like malt water. more effervescence would liven up the body and hide the alcohol better. leafy feel and alcohol dryness left behind. could be much better. D- i might have to put the doppelrock over there with grassroots ale. some tweaking is necessary to take this one from "meh" to "rock solid". The Doppelrock from Great Lakes Brewing Co.